Coltrane’s schedule for this week is here: The “meeting with faculty member” is with me, to talk about the Senate motions on athletics and on faculty participation in administrator hiring and review. Why would that be confidential – Coltrane agreed to it in the middle of a Senate meeting. Interim President Coltrane participates in Sexual Assault Awareness Month by speaking during the Men and Allies United rally. Interim President Scott Coltrane thanks student orientation staff for their leadership work to welcome the incoming classes. 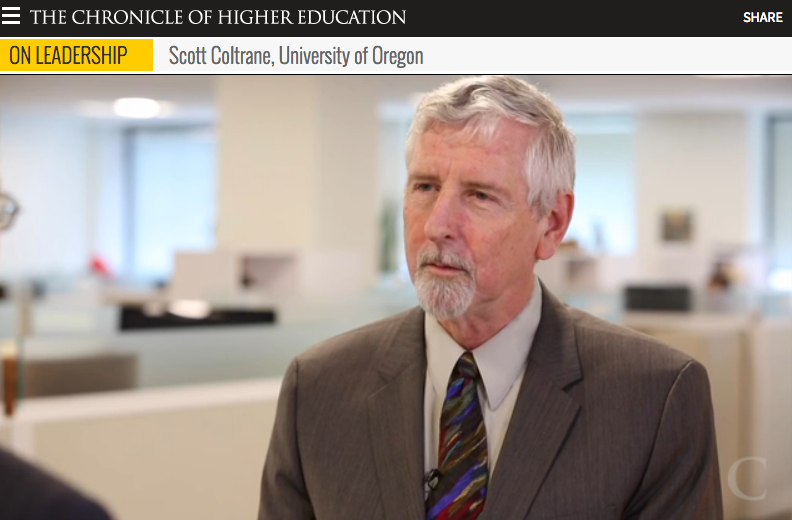 President Coltrane will provide advice for what he hopes each leader will share with the new students coming to the UO. Joining with the campus community, interim President Scott Coltrane will participate in the annual Take Back the Night event as part of Sexual Assault Awareness Month. Interim President Scott Coltrane attend the quarterly meeting of the community groupt that provides advice and perspectives related to equity, diversity, and inclusion at the UO. When UO is booted from the AAU, will it also stop its self-proclamation as the flagship university? Translation: we’ve been facing this challenge for a long time now. Others are just now hitting it. Yes – Like LSU. Drastic cuts from the state, which will still leave the Louisiana contributing more than Oregon does, if my math is right. So Coltrane’s out on the job market? Good. Comes across as a nice smart guy, plus points for being a tall male, but he has no clue how to administer. UofO wouldn’t be so hard to run if the administration would simply do the right thing and stop creating their own problems. Is the administration free to do the right thing, or is it wholly owned by Athletics? We need stable leadership at UO.